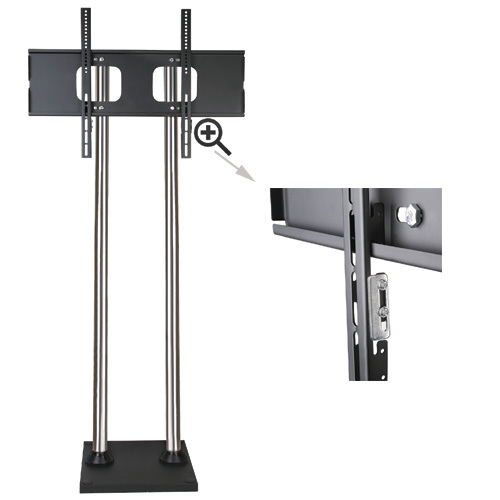 The Allcam FS400B is a premium quality TV floor stand with a universal TV/monitor bracket suitable for the vast majority of 32” to 65” flat screen TV’s (see below for bracket size selection). The stand is part of Allcam’s heavy duty range and is finished to a high standard featuring two 1.4 m high, 2 inch diameter chrome poles with jet black brackets and base. The base needs to be fixed to the ground for maximum stability. The Allcam FS400B static floor stand is suited for busy areas such as foyer’s and lobbies, for displaying adverts and product information to customers and visitors. The stand has a sturdy bolt-down design, meaning it will not be knocked down by a careless bump in these busy environments. An optional tempered glass shelf for laptops, Blu-Ray or DVD players and can be purchased for £19.98 each here. Universal fit TV/monitor bracket for 32" - 65" plasma/LCD/LED screens (*see FAQs below). The Allcam FS400B TV stand is suitable for the vast majority of TV’s with screen size 32” to 65”. The TV uses a VESA mount which the vast majority of modern TV’s use, and several brackets sizes are available for this TV which can be selected when you order. The VESA system is expressed as H x V where H and V represent the length of the distance between these threaded holes horizontally and vertically respectively. For example VESA 480 x 330 mm would be suitable for any TV with horizontal spacing less than 480 mm and vertical spacing less than 330 mm. Q1: My TV is smaller than 30", will the FS400BD TV stand still work? Q2: It seems that the FS400BD TV stand will fit my TV but I need to be able to move it around freely. Is there a version of this stand that is mounted on wheels? A: We do offer the same TV stand with wheels, our model number FS401 (no shelf) and FS402 (with one shelf). Generally speaking as long as the VESA holes are less than the standard specified, the TV should be compatible. You may wish to choose a larger size if you might use a larger screen in the future. Keep in mind that the stand may stick out above and below the TV if the TV bracket you choose is significantly larger than your TV. Larger brackets might interfere with access to your TV’s display ports, if these are in line vertically with the VESA holes on the back of your TV on some less well designed TV’s. The Allcam FS400BD TV stand comes with a full 5 year warranty.